Several community advocacy groups are set to lead a rally next month against the proposed Woodhaven-Cross Bay Corridor Select Bus Service plan. 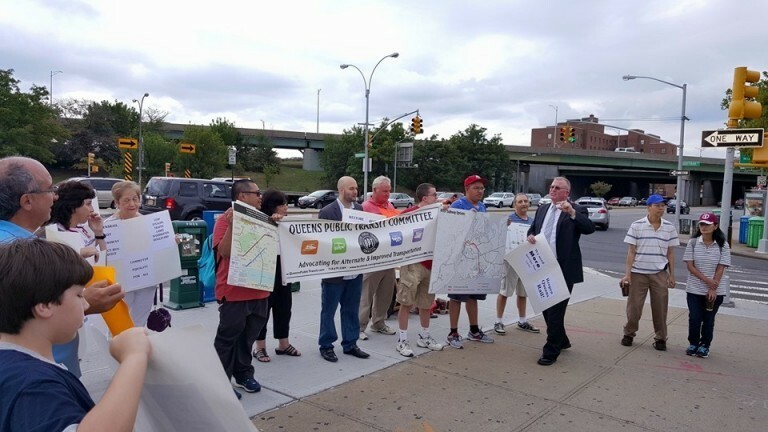 The demonstration, which is being organized and produced by the Woodhaven Residents’ Block Association, Greater Woodhaven Development Corporation, Woodhaven Business Improvement District, and the Queens Public Transit Committee, is scheduled for Saturday, Aug. 6, at noon at the intersection of Woodhaven Boulevard and Jamaica Avenue. The proposed SBS path is based on the existing Q52/53 bus route – a vital north/south thoroughfare carrying over 30,000 daily bus riders in the World’s Borough, along with heavy traffic volumes. According to the WRBA, the goal for the upcoming event is to send a clear message to Gracie Mansion and City Hall. “Thousands of people along Woodhaven and Cross Bay boulevards strongly oppose the de Blasio administration’s SBS plan,” the civic wrote in a statement to The Forum. “Because DOT and MTA have attempted to ignore and downplay the community’s objections, we need this rally to get our voices heard. “We want the de Blasio administration to know how unwanted the SBS plan is. We want to educate the many people who are unaware of this plan and allow them to register their opposition. And ultimately, we want DOT and MTA to wake up and scrap this proposal, replacing it with something that actually accounts for the community’s concerns and needs. “Last year, organizations pushing an agenda that ignores our community’s concerns held a so-called ‘rally’ outside City Hall. That event supposedly indicated support for SBS in our community. Yet that event was held far away from here, and included almost nobody from our community. Moreover, it was very poorly attended, even though a massive, influential public affairs agency touted it. Welcome to the online home of The Forum. Be sure to like us on Facebook and follow us on Twitter @forumnewsqueens. Our full archive is still available at our old website.